Exclusive club house of 60000 sq ft.
Lansum Etania is one of the residential developments of Lansum Properties LLP, located in Hyderabad. It offers spacious and skillfully designed 3 BHK and 4 BHK apartments. The project is well equipped with all modern amenities to facilitate the needs of the residents. What is the location of Lansum Etania?The location of the project is Nanakramguda, Hyderabad. What is the area of apartments in Lansum Etania? 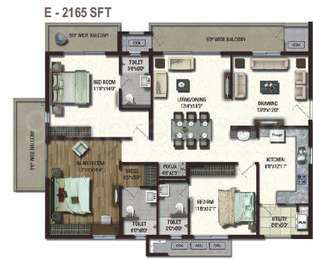 The area of apartments offered in the project ranges from 1890.0 sqft to 4085.0 sqft. 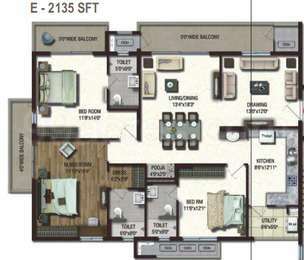 What is total area of 3 bhk in Lansum Etania? 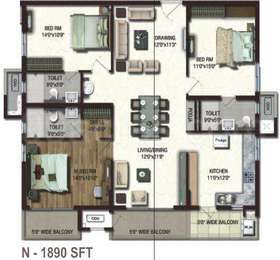 3 BHK units in the project are available in a size of 1890.0 sqft to 3265.0 sqft. What is the 4 bedroom size in Lansum Etania? Four-room units (4BHK) in the project are available in an area of 4085.0 sqft. How much is the actual area of Lansum Etania?The area of the project is 8.0 Acres. What is total price of 3 bhk in Lansum Etania? 3 BHK units in the project are priced at Rs. 12285000 to Rs. 21222500. Lansum Properties is a developing builder group in Hyderabad city. It aims to improve technological aspects for better construction and results. The group is led by Mr. K. Umesh, who has been serving the nation with his civil services. He came to the real estate industry to fulfill his passion about constructions and providing people with low cost and well-maintained homes. Some of their remarkable works include Lansum Etania | Madhav Towers | Lansum Greens. Hi Rakesh, If you want to sell your property, you can post an advertisement here: http://www.99acres.com/do/buyourservices You may write to us at feedback@99acres.com or call us at our Toll-Free # 1800 41 99099 (Monday - Saturday 9:30AM to 6:00PM IST) for further assistance. any flats of 3 bed available for purchase and occupancy in 1 year time now?